August 2nd 2018 - ATLANTIS, Fla. – This week, Championship Tour Event #7 was held at The Breakers Rees Jones Course in West Palm Beach, FL. Two familiar faces captured victories on the difficult course. Carson Parker of Boca Raton and Tyler Pham of Pembroke Pines found themselves tied for the lead in the boys’ division after 36 regulation holes. Parker birdied the difficult 18th hole to force the sudden death playoff. The playoff returned to the 18th hole and Parker was able to make birdie again to capture the boys’ overall title over Pham. Pham would take home the boys’ 16-18 age division, while Nicholas Estrada of Lake Worth would take home the boys’ 13-15 age division. Andie Smith of Hobe Sound put on a dominating display this week. Smith fired rounds of 76-77 to capture the overall girls’ title by three strokes. This is Smith’s first Championship Tour victory. 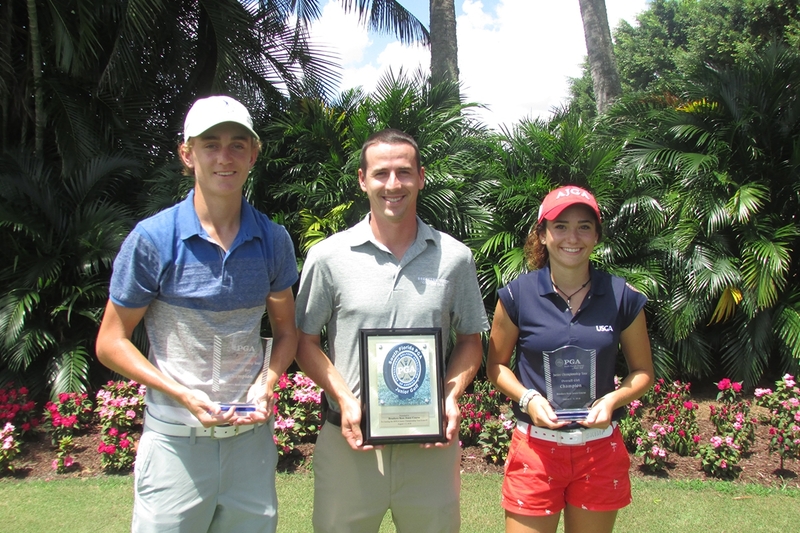 Caroline Patterson of Jupiter took home the girls’ 13-15 age division, while Nicole Cee of Port St. Lucie took home the girls’ 16-18 age division.